Anyone who wants to approach the Medieval translations from Greek into Arabic has to face the problem of the relationship between the original Greek text and its version. The Arabic translators were often compelled to alter the order of the Greek sentence for syntactical reasons. At times, they also changed the structure of the text. An example is the Arabic translation of Aristotle’s Metaphysics: in the Arabic version, the first two books appear in reverse order with respect to the Greek. Alpha elatton – i.e. one of the two introductory books of the Metaphysics as it has come down to us – antecedes Alpha Meizon, the well-known beginning of Aristotle’s work. This is the case also for the Arabic translation of Plotinus’ Enneads, which has come down to us mainly via the so-called Theology of Aristotle. G2A Web Application has been developed to deal primarily with such difficult cases, in which the order of the Greek text is substantially altered. It is obviously useful also in cases where the Graeco-Arabic alignment is less problematic. 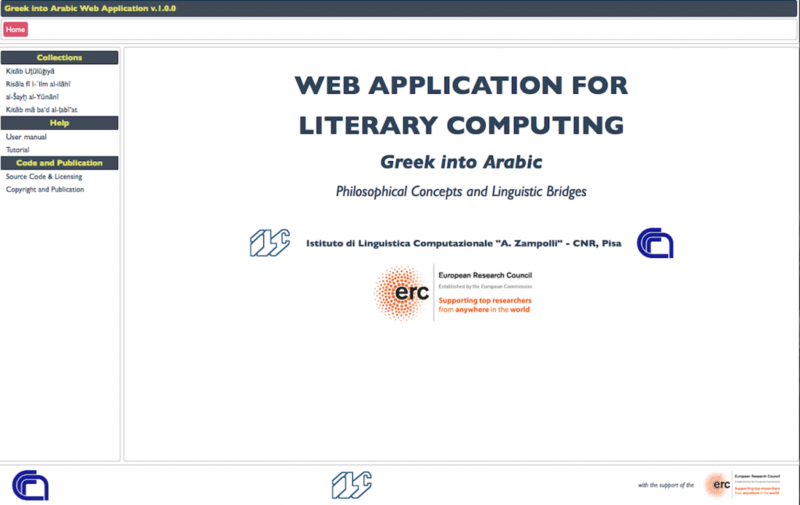 G2A Web Application for computational philology (g2a.ilc.cnr.it) is a Research Infrastructure for managing translations. It has been designed and developed, under the guidance of Andrea Bozzi, by Simone Marchi and the team of the ILC-CNR, following an innovative method based on computational philology and computational linguistics as applied to historical and philosophical texts. The scope of G2A Web Application is to facilitate the comparison between an original work and its translation, no matter if one or both languages are in non-Latin script, as is the case with the Graeco-Arabic translations. At present, G2A contains a collection of three texts, that cover the whole of Plotinus’ writings that have been translated into Arabic. The three texts are the pseudo-Theology of Aristotle, the collection known as the “Sayings of the Greek Sage”, and the pseudo-Farabian Epistle on the Divine Science. The system also includes a portion of Aristotle’s Metaphysics, to be completed in the next few months. For each work of the Plotinian collection, the user has at his disposal the data concerning the bibliographical references, an overview of the manuscript tradition, a description of the structure of the Arabic translation, and finally a searchable bibliography of some 200 titles. The main function of G2A Web Application is to show the correspondences between each portion of the Greek text and its Arabic translation. 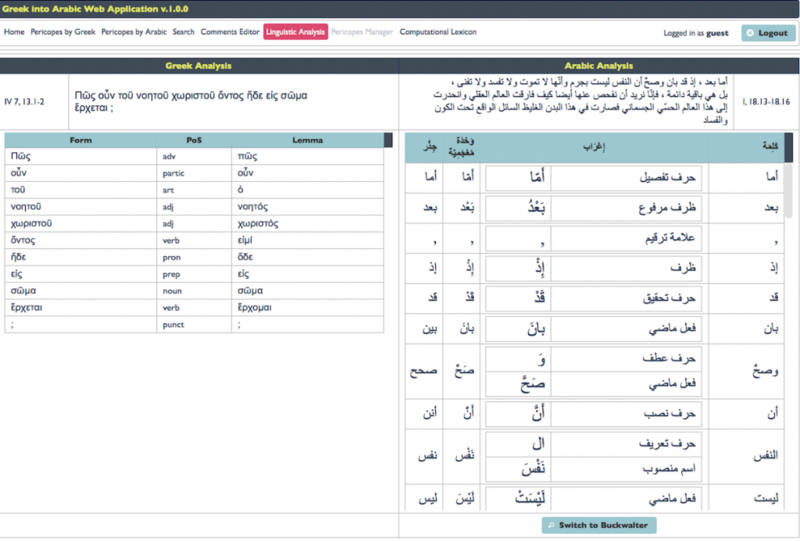 The system allows the user to see the correspondences between the Greek and Arabic sections of the text (or pericopes), that can be ordered both according to the Arabic flow and the Greek flow. This function allows the users to see any modification of the flow of the Greek original done in the Arabic translation, helping in this way to understand how the original text has been transformed. The alignment of the correponding passages helps to raise the question why did the Arabic translator change either the meaning of the words (for instance by adding explanatory words), or the order of passages, or both. This obviously applies only in cases of translations that are heavily adapted, as is the case with Plotinus; most Arabic translations are literal, but also in this case the careful alignment of the Greek text and its Arabic version is helpful. Each pericope can be commented upon: a special function allows the users to insert and resume comments, working also in a collaborative way on the net. The whole annotation is semantically classified, and it can be easily resumed from the list button on the left. G2A Web Application allows users to search for Greek and Arabic words, roots, forms, and lemmas. Both the Greek and Arabic texts have been fully analyzed, in order to allow the users to see the linguistic analysis of each pericope. The main principles of G2A Web Application are modularity, flexibility and software development compliant with open source criteria. These elements make it possible to include additional items in the modular structure, thus allowing the application to extend its functions to fields other than the study of Graeco-Arabic translations. Possible fields range from classical and medieval philology to genetic criticism and the philology of ancient printed texts.